Adirondack Land Value in "This Market"
I've been getting a lot of questions about the status of the real estate market here in the Adirondacks, considering the current state of the national real estate and lending industries. Based on my observations and experiences, and those of my more learned colleagues at the Prudential Terry Horrocks Real Estate Agency in Lake Placid, the Adirondacks are faring pretty well. The overall feel is that while the pace of property transfers has slowed somewhat, values are holding rather steady and we are all happily hard at work showing and listing property. It is worth noting real estate agents here in the Adirondack region of upstate New York enjoy a unique advantage because of how property is valued. Pretty simply, just like property elsewhere; value is based on the law of supply and demand. 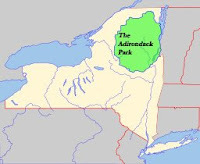 From there it gets slightly more complicated since most of the property I work with is located within the six-million acre Adirondack Park. It is like living in a National Park, but owning your land and conducting private industry. And that is exactly what it is; private land surrounded by government-owned land that will never be developed. Therefore, there is limited develop-able, private land available. This, of course, makes it dear, or valuable. As a matter of fact, in most towns in the Adirondacks the State of New York owns a majority of the land. There are some towns where state-owned land comprises as much as 97% of available property. For example, the state owns 75.6% of land in the Town of North Elba, which is where the Village of Lake Placid is located. State owned land in the Town of Keene is 68.2%. You see what I mean; these numbers don't leave much private property available for frequent transactions.